Wednesday June 1 1910 Was very busy forenoon and went to town at 2.12 I selected a lamp for reading and did other errands I called at Margaret Lee's but did not find [illegible] Gray Curtis there. Came home at 4.30. After doing the evening work I went down to Pointoins to use the phone and went up to see Mrs Robinson awhile. It is 23 years since Ott and Fannie were married A card from L.D.L. letters from Martin Mason & Alice Condon. 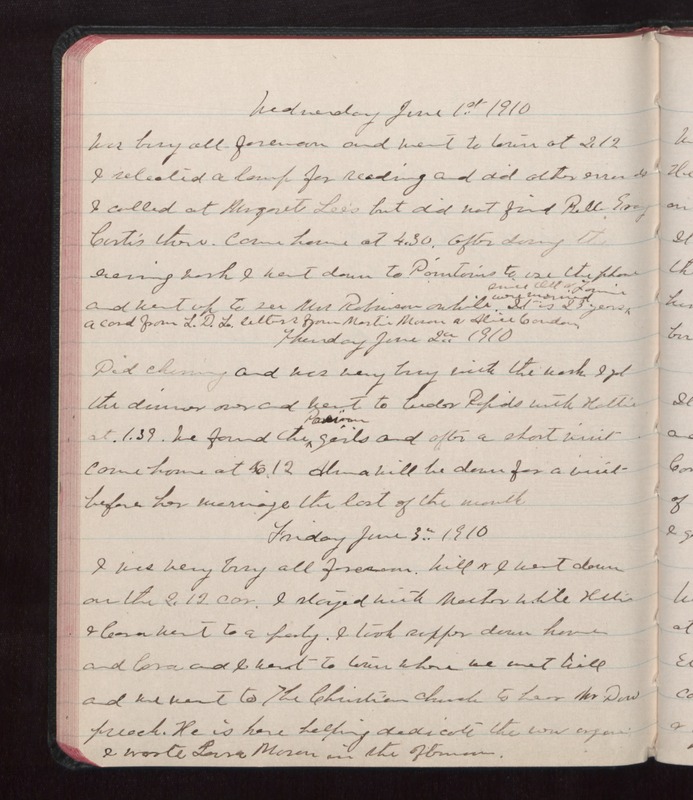 Thursday June 2 1910 Did churning and was very busy with the work I got the dinner over and went to Cedar Rapids with Hattie at 1.39. We found the [illegible] girls and after a short visit came home at 6.12 Alma will be down for a visit before her marriage at the last of the month Friday June 3 1910 I was very busy all forenoon. Will & I went down on the 2.12 car. I stayed with Mother while Hattie & Cora went to a party. I took supper down home and Cora and I went to town where we met Will and we went to The Christian church to hear Mr Dow preach. He is here helping dedicate the new organ. I wrote Lorna Mason in the afternoon.